Do your kids love play dough? The play dough center is always a favorite among young children. We all know that play dough is a fun and engaging activity for young kids, but did you know that play dough has many educational benefits too? 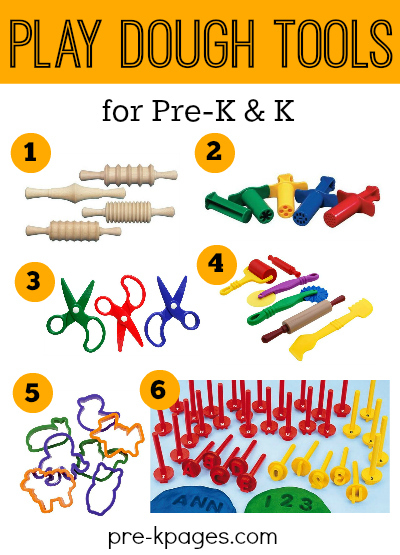 Here are some of the supplies every play dough center must have as well as some of the skills supported by using dough in the classroom. Often, space is at a premium in early childhood classrooms, we have lots of little bodies that need space to move and play and not enough room to do it in. I encourage you to think about having a separate tub for each of the materials in your play dough center. When the materials are separated it sends the message to your children that these items are important enough to have their own space. If play is the work of young children and play dough is one of their favorite ways to do that work, then the work should be respected. 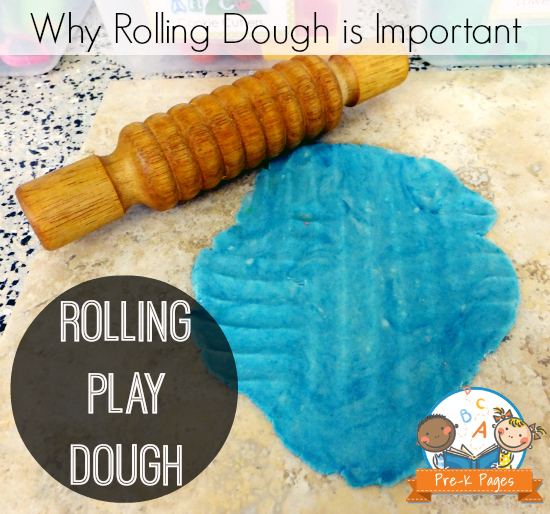 Rolling pins are a staple of any play dough center. Some people may think that rolling pins are dangerous or not important, but rolling pins actually provide opportunities for children to develop the muscles in their hands- specifically the palmar arch, that are necessary for holding a pencil and writing. The rolling pin pictured here is one that children have to actually roll against their palms to work properly. Some rolling pins have a rolling feature that allows the child to just grip the handles. The rolling pins without this feature are the ones that will help develop the palmar arch. Academically speaking, if children are going to be expected to write their names or write for a purpose in kindergarten they will need well developed muscles in their hands to do so. Providing your students with rolling pins in the play dough center directly supports the development of writing skills. Scissor skills can be tough for many young children to master. They struggle to hold the scissors properly and have difficulty holding and cutting the paper. 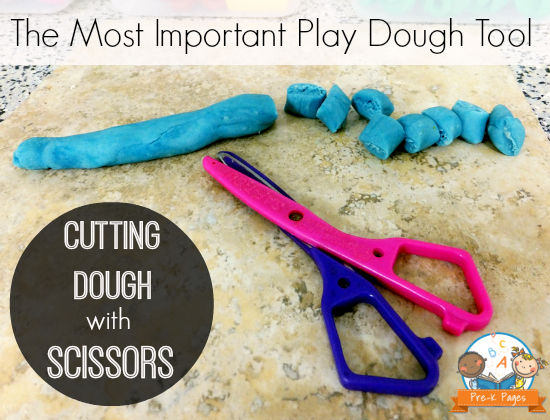 Using scissors with play dough is the perfect way for young children to practice their cutting skills in a safe environment. The cheapest, plastic scissors you can find are best for use with play dough- metal scissors will rust. Children tend to be less frustrated when they use scissors with play dough than they are when they use scissors to cut paper. 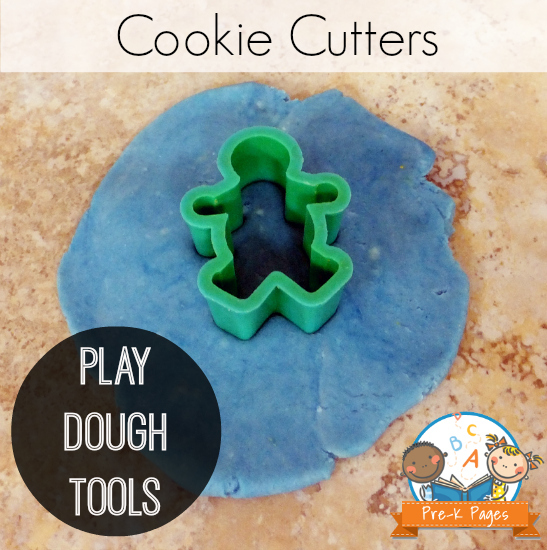 Play dough provides a fun and non-threatening way to practice cutting. Of course, cutting also exercises the muscles in the hands and fingers that will be necessary for writing. Nothing could be more academic than learning how to spell your own name. These alphabet stampers provide the perfect way for young children to practice identifying the letters in their name. 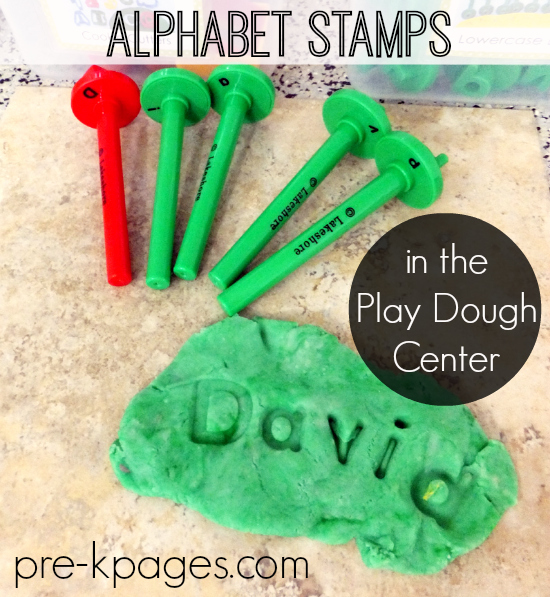 The play dough doesn’t get stuck inside the stampers like it does with cookie cutters. The letters on the stampers are also more realistic looking while some cookie cutters use block fonts that are difficult to recognize. 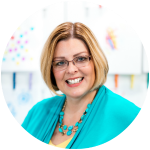 Be sure to provide name models for children to look at as they make their names- cards with the children’s names written on them work well. Creativity and imaginative play are other important skills supported by using play dough in the classroom. An added benefit of making people or creatures with play dough is that children will often lend voice to their creations- a great way to support oral language development! The people pieces seen here are from a kit; however Mr. Potato Head pieces work just as well. I have some basic cookie cutters I keep out year round, and other thematic cookie cutters that I put out at certain times of the year to keep things interesting and exciting. Kids also love to use their imaginations and create with cookie cutters. They have even been known to create entire scenes from stories and then retell the stories using play dough- you can’t get more academic than that! 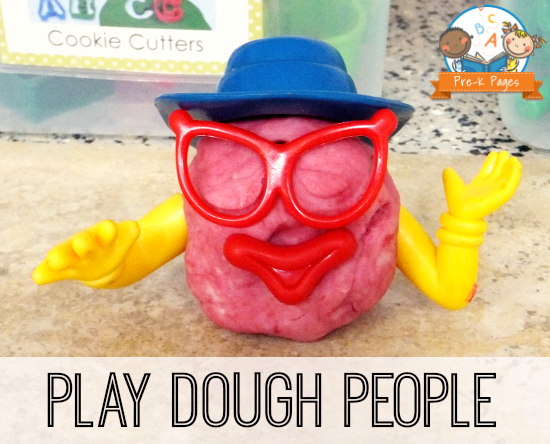 Follow my Play Dough board on Pinterest for more great ideas! 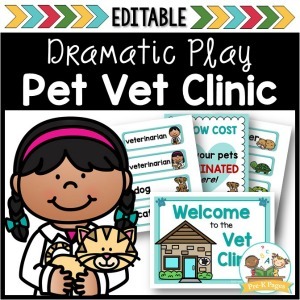 Previous Post: What’s in Your Dramatic Play Center? I have many of these tools as well as plastic placemats for work surfaces and mats that are more used as teaching tools/skills. ie. form this letter, make this shape, show the correct amount etc. Hi Sue! Thanks for sharing, I just love play dough! We use play doh a lot, I like the idea of a play doh center with tools separated in their own spaces/containers. 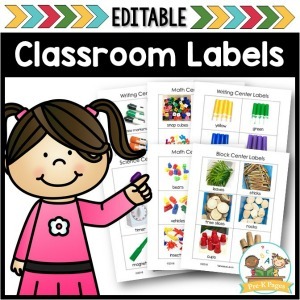 How can I find the labels like you have? Hi Doreen, Thanks for stopping by! To make labels for your tubs you can take pictures of the items and print them out, then attach to the tubs. You can also do a Google search for the images you want, then save and print. I especially appreciate that you chose to include the benefits of various materials to be used in a play dough center. So often, emergent writing activities in preschool are viewed as “just play”, but it is so important to remember that at such a young age play is how children learn, and playing with play dough is one of the best way to develop both the fine and gross motors needed to learn how to formally write. Pinned and shared on Facebook. Play Dough is a wonderful tool for learning. It is a ton of fun and it gives kids the chance to express their creativity in so many ways. 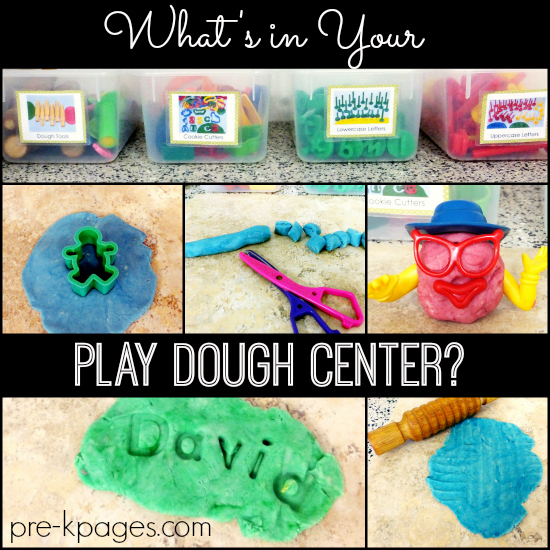 I love the idea of having a play dough center. I am going to start gathering and separating our play dough toys today! 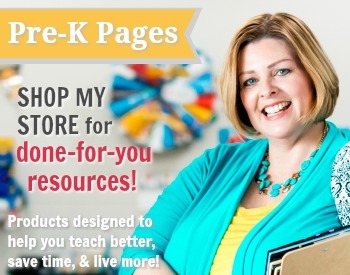 I absolutely love your site. 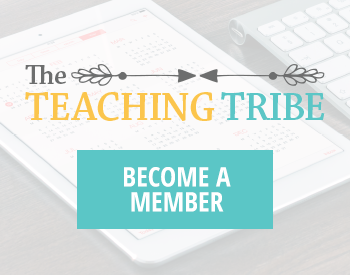 I am new to preschool after teaching other grades for 25 years. I used your ideas to set up my centers. I just finished with the ABC center. Thank you for your HARD work! !